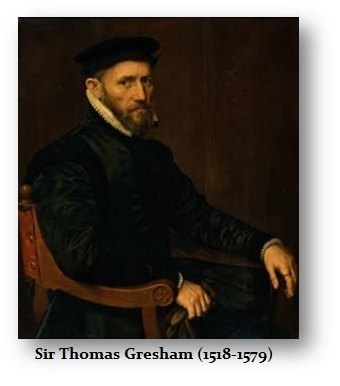 Sir Thomas Gresham was an English merchant and financier who became the financial Adviser to Queen Elizabeth I (b 1533; 1558–1603) of England. Gresham first articulated this in 1558 for what he is best remembered for Gresham’s Law, which was the statement that “Bad money drives out good.” Henry VIII (b 1491; 1509-1547) engaged in competitive devaluations of the precious metal content often following the lead from Spain. Gresham noticed that as the coinage was being debased, it actually shrunk the money supply for people would hoard the old coinage. The more the debasement, the more the money was hoard shrinking the supply in circulation. One the one hand prices rise in terms of the new debased money, but on the other hand, there is also deflation as real money becomes scarce and buys more. Gresham was first an agent for the English Crown in the Amsterdam financial market, which at the time was the financial capital of Europe. By observing price movement of the currency or foreign exchange market (FOREX) in Amsterdam, Gresham arrived at his famous Gresham’s Law that bad debased money would drive out the old good money of higher content from circulation causing the people to hoard. It was thus Gresham who then became an adviser to Queen Elizabeth I (1533-1603). In 1566-68, Thomas devoted some of his wealth to found the Royal Exchange in London, to compete with what he saw in Amsterdam. In effect, Gresham’s Law has been proven to be correct many times throughout history. However, it has also led to the thinking of the Austrian School of economics which may have been logical based upon the early days of Henry VIII, but this idea of maintaining the value of a currency as a store of wealth is just not practical. The value of the currency has always fluctuated for in part its value is also based upon confidence in the government. This is why we find imitations of the coinage of Rome in India, which are not debased or attempts to counterfeit the coinage for profit. The imitation of the coinage of Athens, Rome, Macedonia and so on, is a reflection that a piece of gold or silver stamp with that mark is more valuable than just a piece of metal. 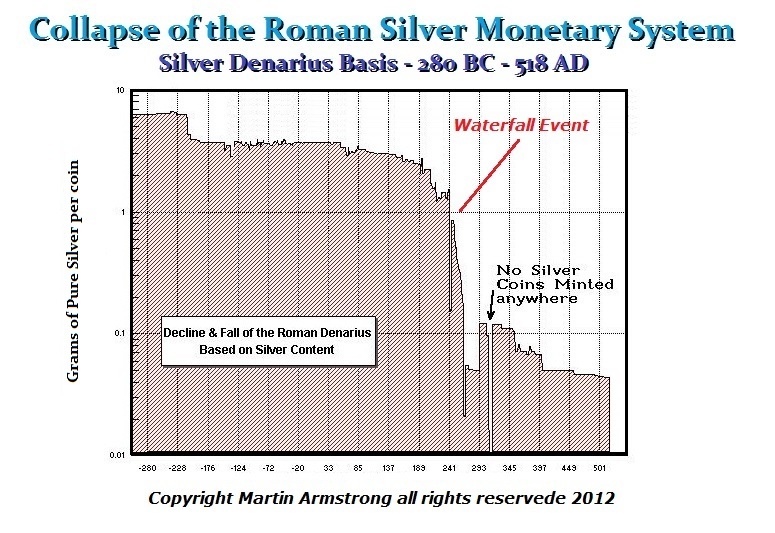 Likewise, we still also find hoards of debased coinage especially during the 3rd century AD when Rome was collapsing. 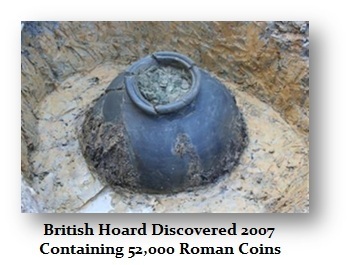 Ancient hoards are most often found during periods of political instability. There does not appear to be a definitive hoarding of coins that are higher based simply for that reason. The major hoard discoveries center around periods of uncertainty from politics or invasions. Much of the Austrian School is based upon hard-money. What they have been proven dead wrong about is the Quantity of Money theory. With Quantitative Easing, the European Central Bank and the Federal Reserve have been unable to create a corresponding increase in inflation. The reason why the Austrian School has failed is simply stemming from two aspects. First, taxation would be typically less than 15% historically until the 20th century and the introduction of socialism. As taxes rise, the NET disposable income declines and the size of government rises. Secondly, the debasement of coinage that Gresham witnessed resulting in the hoarding of the old currency was a means of government increasing its expenditures through debasement. Today, governments simply issue debt nonstop. These two factors have changed the dynamics and thus the Quantity of Money has become irrelevant against the increase in these two factors that were minimal historically.